Homer; translated by Richard Seibert; illustrated by Winifred McNeill. The Helen Fragments is a collaboration between two contemporary artists who have come together over an ancient text that has fascinated readers for millennia. 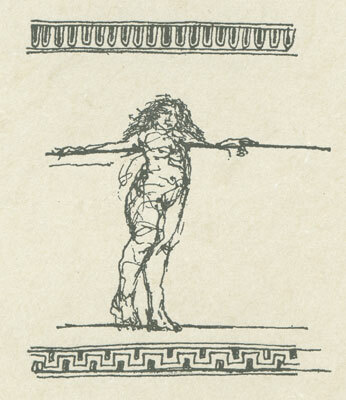 The poet and printer, Richard Seibert, has selected portions from Homer’s Iliad that tell the tumultuous story of Helen of Troy and has translated them from the original Greek into contemporary lyric. Winifred McNeill, a New York based artist, working over a period of two years, completed over a hundred drawings for this project. 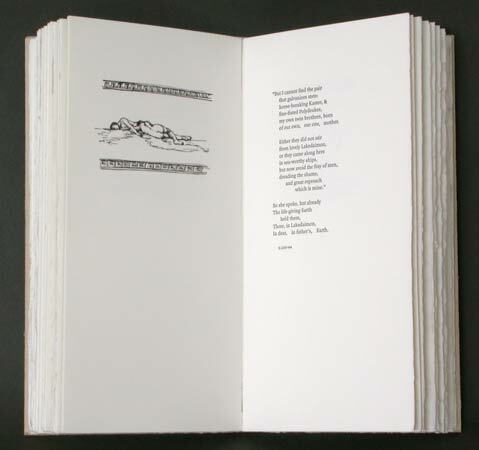 Each of the fifty fragments is accompanied by a drawing that has been reconfigured digitally under the supervision of the artist and printed letterpress from polymer plates. The text is composed in Monotype Quadraat and the epigraph is in Wilson Greek. Printed from photo-polymer plates on Zerkall Bütten-Karten paper by Max Koch at the Koch Studio. Cover paper made specifically for this edition by David Kimball. Non-adhesive, external, long-stitch binding with leather tabs designed by Victoria Heifner and bound by John DeMerritt. 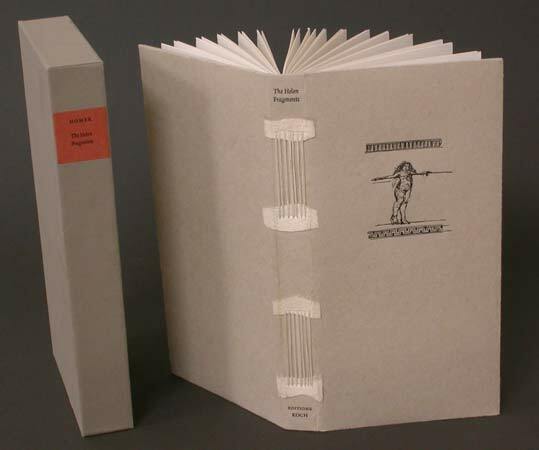 Edition enclosed in a paper-covered slipcase with spine tab plus chemise.